holiday by the sea, or simply a good choice for a getaway. The Masseria Li Foggi is located in the heart of Apulia, close to the Lido of Gallipoli and only around 1 km away from the jonian sea and on the border of the nature park of Punta Pizzo – the island of Sant’Andrea, an oasis and peaceful place where to find a sanctuary. The distance from the airport of Brindisi is about 90 km. 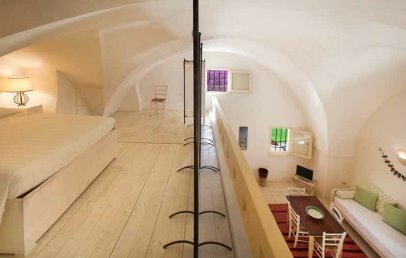 The Masseria Li Foggi, a typical land house, has been built in the 16th century and was domicile of an aristocratic family and today transformed in a unique site of peace and relax. The colours, the sounds and the air is lightly perfumed by salty smell, rosemary and olives and enchants the guests. 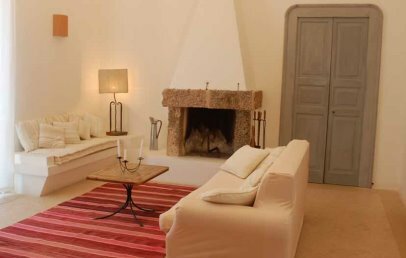 A stone's throw away from the Masseria, the elegant Casina Li Foggi is located in an old manor house dating from the early 1900s. It differs from the surrounding houses for the elegance of the architecture, so as it creates a strong and attractive contrast with the wilderness in which it occurs. Casina Li Foggi was restored giving particular attention to the materials and to the original structure of the house, recovering and enhancing its original essence. 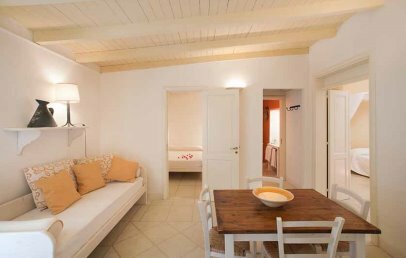 In total the Masseria Li Foggi has comfortable accommodations, all have various dimension and offer one or two bedrooms, a living room with kitchenette, equipped with dish washer, bathroom, air condition, private terrace facing the Masseria’s garden. The internal architecture is vaguely Moorish in its design and is characterised by the thick walls decorated with warm colours, vaulted ceilings. Much time has been spent, thinking and re-thinking each single detail, in order to make every single corner of the apartments, a unique piece of heaven. Beautiful terracotta features, the bed linen in natural fibres and the splendid curtains which are coupled with wooden and iron features, offer guests a sober but refined style. 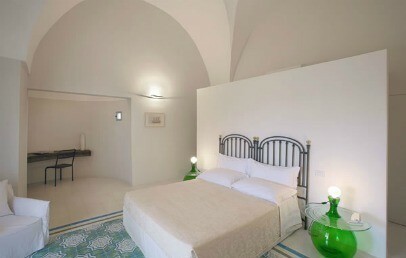 Junior Suite – for 2/3 people, with one bedroom. 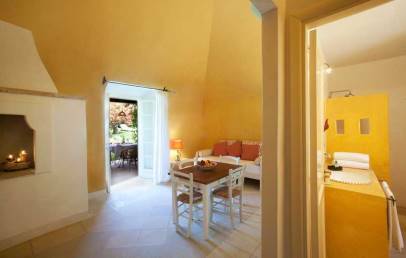 Family Suite – for 2/4 people, with two bedrooms. 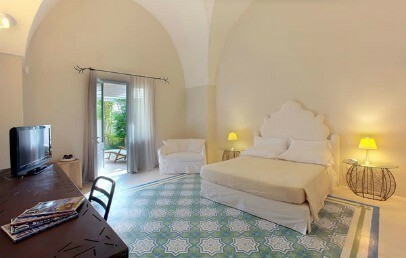 The mansion Casina Li Foggi has three spacious Deluxe Rooms and one elegant Suite. 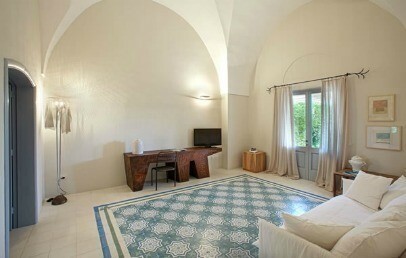 The warm Mediterranean colours of the floors sharply contrast with the soft linen and cotton fabrics. The rooms are on the ground floor. 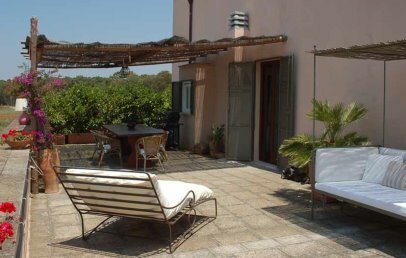 All have a terrace or a garden that overlooks the park of Punta Pizzo. Pool towels are available on request, complimentary. For those who enjoy biking, Masseria Li Foggi offers its guests, free of charge, Mountain Bikes to explore the area independently. City tax – of € 0,50 per person/overnight for June and September and € 1,00 per person/overnight for July and August, for a maximum of 7 obernights (excluding children under 12 years and not self-sufficient disabled people) to be paid on spot. Important – The reception is open during the following hours from 9:00 to 13:00 and from 16:00 to 20:00. Therefore it is necessary to provide your arrival time at least one day in advance. Spacious and comfortable accommodation with a sober and refined style. It is characterised by high vaulted ceiling, thick walls decorated with warm colours, wooden and iron features, terracotta features and linen in natural fibres. It has one bedroom and a living room with kitchenette, one or two bathrooms equipped with shower and hairdryer. It offers a nice, small terrace with garden view. Spacious and comfortable accommodation with a sober and refined style. It is characterised by high vaulted ceiling, thick walls decorated with warm colours, wooden and iron features, terracotta features and linen in natural fibres. 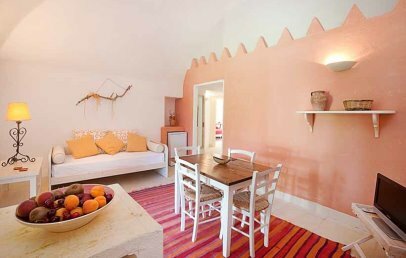 It has two bedrooms and a living room with kitchenette, one or two bathrooms equipped with shower and hairdryer. Patio or terrace. Double room with third bed on request. Located on the ground floor, they have a patio. 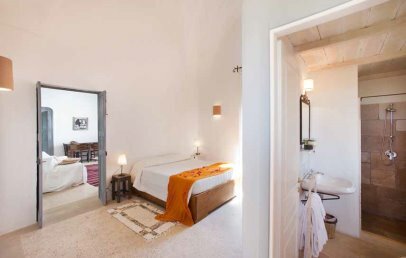 The warm Mediterranean colours of the floors sharply contrast with the soft linen and cotton fabrics. The rooms are on the ground floor. Private bathroom with shower. Double room with sofa bed. It has a double room plus a living room and it is located on the ground floor. It features two small terraces. 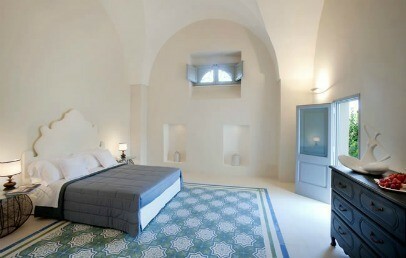 The warm Mediterranean colours of the floors sharply contrast with the soft linen and cotton fabrics. Private bathroom with shower.